Der Test von Pharmawasser auf mikrobielle Kontaminationen führte in der Vergangenheit zu langwierigen Verzögerungen, um auf das Wachstum der Kulturen zu warten oder weil die Probenvorbereitung Einfärbungen und Reagenzien erforderte. Damit ist jetzt Schluss. Der online 7000RMS (real-time microbial system) liefert kontinuierliche Messungen von Mikroorganismen und inerten Partikeln in Echtzeit. Mit dem 7000RMS entfallen routinemäßige Labortests und damit fallen auch keine Probenvorbereitungen mehr an. Die unmittelbare Warnung vor mikrobiellen Kontaminationen ermöglicht eine schnelle Behebung des Problems und verhindert so eine Beeinträchtigung des Produkts. Der reduzierte Bedarf an Laboruntersuchungen und Energieeinsparungen durch optimierte Desinfektionszyklen führen zu spürbar geringeren Betriebskosten. Mikroorganismen und inerte Partikel werden mithilfe von lichtinduzierten Fluoreszenzmessungen, Mie-Streuung und aufwendigen Algorithmen erfasst und quantifiziert. Der 7000RMS kann ebenfalls solche Organismen messen, die bei Wachstumsmethoden übersehen werden können. Ganz gleich ob in Ihrer Umkehrosmoseanlage, im Reinwasserlagertank oder im Verteilersystem, der 7000RMS kann sowohl online als auch an der Fertigungslinie eingesetzt werden. Er kann ebenfalls schnellen Tests von Stichproben im Labor dienen. Die Touchscreen-Bedienoberfläche des Analyzers zeigt auf benutzerfreundliche Weise alle wichtigen Daten und Kontrollwerte an. 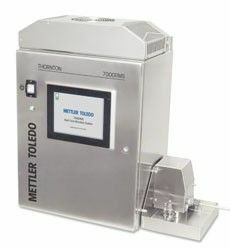 METTLER TOLEDO Thornton’s 7000RMS is an at-line analyzer for real-time measurement of microbial contamination (bioburden) in pharmaceutical water. Real-time Microbial Detection: Results every two seconds, no sample preparation or incubation required. Accuracy, compliance, and high performance are critical for achieving product quality and efficiency in your plant. We support and service your measurement equipment through its entire life-cycle, from setup and configuration to preventive maintenance and calibration to equipment repair. Our teams of well-trained Service Technicians are ready to help you get the most value from your measurement equipment. Let METTLER TOLEDO be your trusted advisor and provide just the right service approach to maximize accuracy, compliance, and high performance for your production needs. You need your new sensors and analyzers to be configured to your specific application for performance and reliability from day one. Setup and Configuration of your measurement instruments by experts from METTLER TOLEDO ensures a productive start and long life. Proper maintenance of your measurement instrumentation helps to safeguard accuracy and productive uptime. Preventive Maintenance services extend the lifetime of your instrumentation ensuring the best performance and value from your investments. Maintaining accurate measurement of your process, compliance to industry regulations, and to critical quality standards are easy to achieve with METTLER TOLEDO Sensor Calibrations. We calibrate sensors traceable to national and internationally known standards, and adjust as necessary, to ensure sensor performance within specified tolerance.